I think an appropriate subtitle for this Saturday's offerings would be "Herriman in a Hurry". 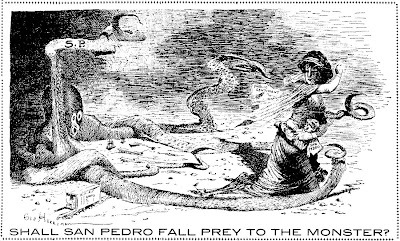 Herriman produced the first two cartoons for the September 16th paper, the second two for the 18th. The first, in which he reports cartoonographically (a fine word I just made up) from a Los Angeles dog show, is obviously a rush job. The cartoon vignettes are small and unimaginative, and the captions, which are ostensibly humorous, all fall flat or are, as best I can tell, simply non sequiturs. The second cartoon is an illustration for a short story. Herriman did a lot of this work at the Examiner. I made copies of very few because the illustrations were typically much smaller and less detailed than this particular one. Herriman got a day off on the 17th, but then came back on the 18th with two ambitious political cartoons. In the first he introduces a new icon to represent the Southern Pacific company, an octopus. He'd use this representation quite frequently from now on, and he was able to draw it very effectively. Unfortunately he was still in a rush, and the woman representing "public sentiment" is very badly drawn. Herriman seemed to be trying to spruce up the rushed drawing with a ton of crosshatching, most of which just turned to mud. The final cartoon is better executed if rather unimaginative, but here Herriman had the opposite problem -- a lot of his linework was too thin and barely reproduced in the paper. Of course my photocopying doesn't help matters any, but much of the background drawing is almost invisible in the paper itself. If anyone finds particular text in the cartoons hard to read just let me know and I'll interpret. 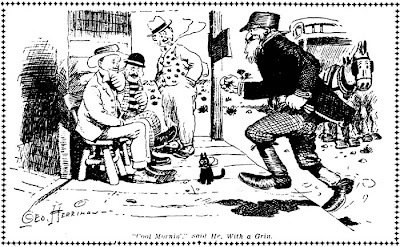 In the last cartoon the two tiny figures at the right side are tagged as Pardee and Black Hayes. Pardee says "Such dog demmy-tasse, such dog", Hayes replies "Uh-Huh". Little to say, just to keep in exercise. re the non-sequiturs in the dog show cartoon. the one at top right is surely a reference to Tad Dorgan. 'Bunk' was tad's dog character around this time. These things can always also be a case of both artists referring to something commonplace we no longer know about, but the 'New York Exhibit' tends to support my suspicion, as well as the figure with long legs, which is how George represents Tad elsewhere. Allan is quick to dismiss this cartoon, but on the contrary i think we should see it as the first glimmer in all of the selections so far of the true Herriman. A great deal of Classic herriman reads like so many 'non-sequiturs' to the unacclimatized ear. Take back you disparaging words i say!!! I take a back seat to no Herrimaniac in my enjoyment of the master's wordplay, and you may be right about the possible Tad reference. But I still say the cartoon is spinach and I say the hell with it. "Very badly drawn" for Herriman is still pretty freakin good for us modern day mere mortals. And yeah, I was having trouble making out the text, if you could post what they're saying I would appreciate it. Man: "Who'd a thought it?" Dogs: "Skip", "Breeze", "Zip Along", "Poke along, poke along, kid", "well, well", "Don't hesitate". Dog: "Now I wonder where that li'l runt's gone and hid? ", "I wonder if that big stew knows who he's sitting on"
Bulldog: "Say wot is that dominant primordial beast anyhow?" Man: "Bunk I'm ashamed of you"
Winged dog caption: A "pipes" idea. Man 1: "Wot again, oh no oh no!!" Man 2: "Don't git scared Mister, we keep 'im curled up so's to save room." Cat: "Come on Mary it's no place for use." Sausages on ground: "You don't catch me here again"
Now my convention report turns into a Library of Congress report. I spent three full days nose to the grindstone at the microfilm viewer. Managed to get the Brooklyn Eagle indexed from 1932 through 1942 (pretty much ending my indexing of that paper) and the Chicago Daily News from 1930 - 34, reaching the end of their syndicate activities. I also got through another several years of the Philadelphia Record (1921 - 1925), and did some miscellaneous spot checking of data in the New York Tribune, New York World, Los Angeles Times and Boston Globe. Can't say that there was much excitement in these papers to report. I did find start and end date for Chester Gould's The Girl Friends, a rare strip that ran only in the Chicago Daily News. Turned out to be a pretty good strip, too. I also finally got all my ducks in a row on Foxy Grandpa. The last Sunday version of that series, which ran in the New York Herald, was for some reason omitted in Ken Barker's index of that paper. 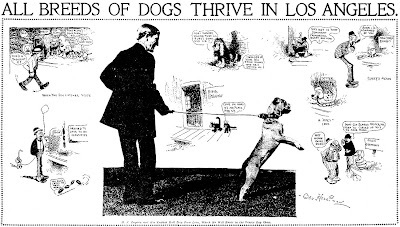 Foxy Grandpa was also recently pinned down further when Cole Johnson reported the existence of yet another series, this one a daily, that ran in the Philadelphia Bulletin in 1922 (by the way, Cole, please send me an email -- I can't find your email address). For those with an interest in science fiction strips I'll report the discovery of what might be the most obscure one yet. The Brooklyn Eagle ran a sci-fi adventure titled The Mysterious Island in their Sunday kiddie section for just two months in 1935. Another good find was an absolutely certain end date for Keeping Up With The Joneses. I'd always been perplexed that the standard references all place the end of this strip in the 1940s, yet I've never seen any from later than 1938. The Brooklyn Eagle put an end to any question by running the last strip on 4/16/38 which has Pop Momand and his characters officially announcing their retirement. For those who are interested in photo-comics, as I know several blog readers are, I have one to add to the list. I knew that there was a comic strip series titled Two Black Crows (featuring a popular blackface comedy team of the era) but what I didn't know is that the strip used photographic images of the main characters' faces in the strip, which otherwise was drawn in the normal manner. After a productive three days at the Library of Congress I swooped back into the convention festivities for the final reception and dinner. In previous days I'd gone through the list of convention attendees and made a list of those who have done strips or panels. My mission at the party was to corner those whose information was sparse in the index. I realized that I wouldn't get particularly specific information out of anyone in the middle of a cocktail party, but I did want to touch base. I started with Paul Fell who did the art on a feature titled Mulch. Mulch was a strip about a handicapped Vietnam vet. It was written by Bob Shill for whom the strip was semi-autobiographical. Shill created the concept and shopped it around to syndicates with no takers, so he resolved to syndicate it himself through his own company, Signature Features, with a relative beating the newspaper bushes to find takers. Fell was brought on board to handle the art chores and worked on the feature from June 2000 until sometime in 2002. Seeing little progress in the number of papers taking the feature Paul finally had to drop out from the art chores. He recalls that Shill was trying to find another cartoonist to take over for him but never heard if they had any success in that search. I next cornered Elena Steier, who was on my list for her strip Dinosaur Circus. 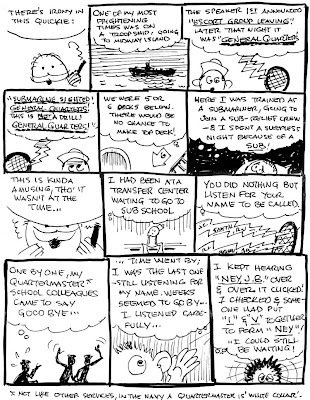 The strip was distributed by the tiny syndicate DBR Media from 2001 until 2003. I was particularly interested in finding out how DBR Media operates. It turned out that Elena confirmed my guess -- DBR paid creators a flat fee so they never received any feedback about the number or identity of papers running the features. This was unfortunate but expected, as I've had a heck of a time tracking DBR's output until recently. I now subscribe to a newspaper called the Lake Region Times out of Minnesota which runs their complete output every week. With cocktail hour waning I managed to find Vance Rodewalt, who did a strip titled Chubb And Chauncey. I learned that it was only available in the US for one year, but that it continued outside this country for an even dozen. Rodewalt initially placed the strip with Tribune Media but found the sales in the US disappointing. He switched over to the Toronto Star syndicate (Rodewalt is Canadian) and had much better success. The Toronto Star apparently had an agreement not to sell into the US market, so Rodewalt lost all his US papers (a fact of which he wasn't aware when he switched syndicates). All turned out okay, though, because he also placed the strip with Editors Press, a syndicate that sells worldwide. Rodewalt told me that the strip was very popular in far-flung places such as India, where it ran for many years in the India Times. Rodewalt and I were still in a huddle after the reception was over, and we ended up having to take it on the run to find the banquet. I do regret very much never having a chance to talk with some of the others who were on my hit list. I missed my last chance to talk to Tom Toles, Jack Ohman, Mike Luckovich, Scott Stantis, Ed Stein, Gary McCoy, Bruce Plante, comics legend Jerry Robinson and many others who were all due for a Holtz inquisition. One I particularly regret is Daryl Cagle -- I wanted to let him know that his very short-lived panel cartoon True! is one of my all-time favorites. Arriving late at the banquet I found my customary place alongside Ivey and Harvey was unavailable, but was lucky enough to find a seat at the table with Lucy Caswell and Steve Greenberg. Greenberg brought me up to date on the long sad tale of the San Francisco Examiner's demise. Steve had the questionable distinction of being their last staff editorial cartoonist before the grand old paper was remade as a rather pathetic freebie. Greenberg and I found that we had something else in common - I'm embarrassed to admit that I had completely forgotten that Greenberg is a fellow Hogan's Alley magazine regular. He writes the excellent column in each issue about editorial cartooning. So we both got to complain about editor Tom Heintjes (kidding Tom!). The dinner program was packed with interesting stuff, enough so that no one got to do more than take a few quick gulps of the dinner fare in between speakers. The founding fathers, Ivey among them, were all asked to speak again, this time with a properly working microphone. Rob Rogers had produced a cartoon depicting the founding members as cavemen which gave everyone a good laugh. David Wallis spoke about his book Killed Cartoons, including his fight with the book's publisher. The publisher, showing an amazing lack of backbone, refused to reproduce a cartoon by Doug Marlette featuring a Mohammed caricature in the book. Considering the subject of the book, this was not only pathetic but also downright bizarre. Wallis told the publisher that their decision would come to haunt them, and apparently media reaction has borne him out on that prognostication. The featured speaker for the evening was Democratic presidential candidate Dennis Kucinich. Although his campaign hasn't exactly garnered a groundswell of support, I for one maintain a soft spot for Dennis. Beyond his being the only candidate completely and unabashedly committed to peace and an end to the Iraq debacle, I've always liked him simply because on a previous trip to Washington, hanging out in my usual haunts at the Library of Congress, I saw him strolling to work, briefcase in hand one morning. No limo, no security, no aides. Just Dennis. And here's the kicker - it was a Saturday! That's the kind of guy we need in Washington. Not to mention that his wife is a total babe. Kucinich was in danger of losing the crowd right off the bat. He led off talking about his love of old comic books, and how his hometown of Cleveland produced Siegel and Shuster. The editorial cartoonists were grumbling, wondering if Kucinich didn't know the difference between comic books and editorial cartoons. Luckily his next schtick went over much better, a very funny plea for the cartoonists to cover his campaign. 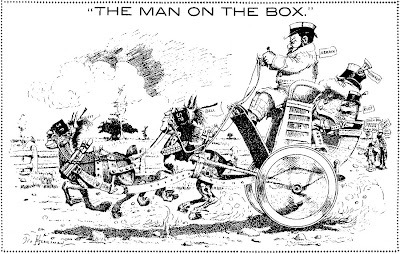 He showed some cartoons drawn especially for the event showing the cartoonists how easy it is to caricature him, playing on the old "Draw Me" matchbook cartoon course ads. Everyone got a big kick out of it. Kucinich then closed with a very moving story of visiting gravesites on a recent trip to the mideast. That was it for the big show. Jim and I turned in immediately because we had an early plane flight, but we found the next morning that editorial cartoonists really know how to party. We were up at 6 AM and ran into cartoonists in the hall who were just them stumbling to their rooms after an all-night beer bash. So that was our trip. Hope I didn't bore you with too many details, but Jim and I really had a great time, and I'd like to once again thank the AAEC, Rob Rogers and R.C. Harvey for making it all possible. See you guys again for the 60th anniversary? I was recruited by Bob Shill to do the artwork for Mulch, which continued via self-syndication, for another two and a half years. Bob had seen one of my strips on a website Tribune Media had set up to feature new artists. You may not be aware, but Bob Shill is a quadriplegic. He would write the scripts and e-mail them to me for artwork. It was a real pleasure working with Bob. Towards the end, I think Bob became more interested in other creative pursuits, so the scripting duties fell to me. Self-syndication ultimately proved too difficult, and in the end we chose to pull the plug on the strip in May, 2004. > two months in 1935. Can you tell me anything about this?? Advanced technology, Lost World/ King Kong adventure? You needed to pose that question 3 years ago Art when my memory was fresh -- I confess I don't remember anything about the specific subject matter at this late date. It is such a pain to make photocopies at the LC that I don't even have any samples on hand. Starting on morning two of the convention Jim and I were to attend a long list of panel discussions. They all sounded very interesting, but I had already warned Jim that when I'm in DC the attraction of the Library of Congress' microfilm room is all but overwhelming to me. I promised to stay by his side in case he found himself in the uncomfortable position of having nobody to talk with between panels. Although Jim had received a warm welcome at the reception the previous night, we could both envision a situation in which he might be ignored by the attendees, the vast majority of whom are younger folk. The first panel was preceded by a continental breakfast. I have never been a breakfast eater so I just swigged a few cups of coffee, a decision that would come to haunt me later. I had a chance to chat with Dave Astor, the editor of the syndicate page in Editor & Publisher. We both bemoaned the fact that the magazine has been reduced to a monthly. Dave told me that about 90% of what he writes for the magazine appears only on their website, and he confirmed my experience that the E&P website is extremely hard to navigate and thus much of his writing is devilishly hard to track down. Dave was accompanied by his vivacious and delightful daughter, Maggie, who contemplates a career in journalism. The first panel, titled "The Future of Editorial Cartooning", was emceed by Ted Rall, Milt Priggee and Clay Bennett. Rall, who has somehow garnered a reputation in some circles of being overly headstrong, turned out to be a great guy, very soft-spoken and amiable -- not at all what Jim and I had expected from his 'advance press'. Later in the convention he was elected as the new president of the AAEC, and he will undoubtedly do a great job of filling the big shoes of Rob Rogers in that role. Speaking of which another round of cheers for Rogers who was a whirlwind of energy at the convention, incessantly putting out fires and making sure that everyone was happy and comfortable. The panel, which was actually more of a town hall meeting, was concerned with gathering ideas to better the lot of editorial cartoonists. As you probably know, political cartooning positions at newspapers are drying up at an alarming rate. The primary reason for this is that newspapers are tightening their belts and thus staff cartoonist positions are being dropped in favor of the more economical syndicated editorial cartoons. A lot of suggestions were tendered, few of them really addressing the heart of the matter. Walt Handelsman injected a heavy dose of reality when he advised the group that they should recognize the staff position was eventually going to be extinct and that cartoonists have little choice but to concentrate on freelancing. Paul Fell made a point, one that I've long been echoing, that editorial cartoonists lucky enough to have staff positions need to make themselves indispensible by concentrating a lot of effort on doing cartoons about local issues, a role that syndicated cartoons cannot fill. Jim Ivey poo-poos this idea, saying that newspaper editors hate local cartoons because they tend to generate letters and calls from readers. How sad that editors can't seem to recognize that calls and letters mean that their readers are interested. Yes, they might be peeved, but they're at least reading the darn paper! At the end of the town hall meeting there was what was supposed to be a quick break before the next panel. This break, though, went on and on, and Jim was being waylaid over and over by conventioneers anxious to talk with him. I realized that Jim's fear of being the boy in the glass bubble was completely unfounded. I took this as my cue to slip out and head off to my mistress, the Library of Congress. It seems ridiculous that I'd pass up the opportunity to attend all these interesting panels, and it is. It was no easy decision to make. But let me explain what a day at the Library of Congress means to my Stripper's Guide Index research. When I'm working through my local library I have to order microfilm with a process called inter-library loan. Every library has different rules about loaning microfilm (and many simply don't), but all libraries severely limit the amount of microfilm that can be loaned at one time. The limit on the number of reels varies between a low of two or three and a high of ten to twelve. Most libraries fall near the lower end of that range. Each request typically takes a month or more to process. That means that in a year, if I'm lucky and everything goes smoothly, and if often doesn't, I get to index about fifty reels of microfilm for a given newspaper. If each reel holds a month of newspapers that works out to indexing just four years of the newspaper per real-time year. Some newspaper microfilm has as little as one to two weeks per reel, though, so that figure can drop to even more dramatically low rates. At that glacial pace a newspaper that needs to be indexed for a long period can take me many years to get through. For instance, I need to index the Brooklyn Eagle for their locally created features from about 1906 through about 1944. To accomplish that task using only inter-library loan would take a minimum of ten years. However, if I'm at the Library of Congress I can get through the entire process in a matter of a few days. When given the choice of attending a few panels or accomplishing literally years worth of work you can see why I might find the siren call of the LC very hard to resist. So resist I did not, and spent the rest of the day at the LC. At the LC it's very hard to take a break -- if the researcher isn't at their assigned desk they won't deliver microfilm -- so I was there until they closed at 9 PM without a break. By then I was famished (remember I had foolishly foregone the breakfast buffet), but I assumed in a metropolis like DC that getting a bit of supper would be no problem. I took the subway back to the hotel and then strolled around the block looking for a place to eat. In an entirely unexpected turn I discovered that all the restaurants were closed -- for some bizarre reason they all shut down at 9 PM. A few bars were open, but that didn't appeal to me, so I went back to the hotel, bought a ridiculously overpriced bag of chips at the small store they maintain and went up to the room resolved that I would be sure to take advantage of that buffet in coming days. When I got back to the room Jim was full of stories about the convention happenings. He was concerned that I hadn't gotten to eat all day, but I dismissed the problem. I've often fasted for three or four days at a time (an exercise of will that I like to engage in periodically) and thought nothing of it. Jim suggested we make a trip down to the street to have a smoke before turning in, so we toddled on down and stood outside the hotel, both blissfully engaging in our filthy habit. One moment I was standing there chatting with Jim, and the next thing I knew I was face down on the pavement with a panicked Jim standing over me calling my name. I'd passed out cold and fallen like a sack of potatos onto the pavement. Waking up from my momentary nap on the sidewalk I found I couldn't even stand, and sent Jim looking for a Coke to revive me. That done I finally managed to get back to my feet and was able to sway and stagger my way back to our room. Taking stock I found that my souvenirs of the fall included a skinned and bruised knee and shoulder, a sprained thumb, and a bloody welt on the side of my face. Needless to say, breakfasts became a required stop from then on in DC. Enough for now, I'll conclude tomorrow. Another great update. I'm glad Jim was so well received. I was also surprised at the kind of nap you took. I thought it would be because the panels wore you out! Jim Ivey was a charter member of the Association of American Editorial Cartoonists way back in 1957. In honor of his role in the founding of the organization Jim was invited to attend their semi-centennial convention in Washington. R.C. Harvey must be given huzzahs for his lobbying efforts which resulted in the invitation, and AAEC president Rob Rogers for getting on board with the idea with no reservations. Jim did have some trepidation regarding the trip. He was worried that his role at the convention would be as a dinosaur on display. Being so long out of the profession, Jim quite reasonably wondered if he would be able to connect with his younger compatriots, few of whom with which he'd had any contact. So it was that he requested I operate as a one-man posse on the trip. The AAEC proved doubly generous in adding me to the invitation not only as Jim's travel companion but with full privileges to attend all convention events. I suspect that the AAEC, recognizing that Jim is north of eighty years, might be in need of some assistance. Jim is, in fact, hale and hearty, but considering that he hasn't done any major traveling in many years, and has a sense of direction rivaling Wrong Way Corrigan, I was thrilled to get the invite, but also relieved that Jim was to be afforded a wrangler for the trip. We both dreaded traveling to Washington on July the 4th, especially right after the bombing attempts in London. Airport security is notorious for behaving like a bag of cats in proximity to such events. However, both the Orlando and Washington airports were, amazingly enough, a breeze. And Washington, famed for having some of the worst summer weather in the country, was actually quite temperate during our stay, and the summer storms all took detours in honor of our visit. The first event on our itinerary was a cocktail reception. Jim and fellow founding members Jim Lange and Hy Rosen were asked to say a few words. Unfortunately either the sound system left something to be desired or my tinnitus-inflicted ears weren't up to the task, because I could only hear a few isolated sound-bites. Otherwise it was a delightful event. I got to renew one old acquaintance, Lucy Shelton Caswell, the curator of Ohio State University's Cartoon Research Library. She had me beet red with her extravagant compliments for my Stripper's Guide Index project. We talked shop and she brought me up to date on the library's progress in cataloging their huge Bill Blackbeard collection. To give you an idea of the massive undertaking, Lucy says that it took eight semi trucks to haul the materials from San Francisco. She assured me that the collection listings are now available on the OSU website -- I'll be looking further into that in coming days and reporting back here. I met Lucy's husband Jeff for the first time, and was fascinated to learn that his father was a salesman for Western Newspaper Union, a company that ran a syndicate for weekly newspapers from the 1920s-50s. Turns out that WNU apparently let the syndication business slide into oblivion because their main business by the 40s and 50s was selling newspaper supplies like paper and ink. Also got to meet Tim Jackson, an editorial cartoonist whose work appears regularly in the Chicago Defender. Tim, in addition to his editorial cartooning, is a historian with a keen interest in the cartoonists of the black newspapers. We've corresponded via email in the past, and it was great to meet him in person. We had a little talk about the Smith-Mann syndicate, a subject of fascination for both of us. Unfortunately our time together was brief -- Tim is a very soft-spoken fellow and I didn't want to drive him to distraction with my incessant requests for him to repeat himself. Also got to meet my very favorite of the new crop of cartoonists, Keith Knight of K Chronicles and Th-Ink. I was astounded to find out from him that his style, which to me is so obviously reminiscent of Harvey Kurtzman, owes no debt to that great cartoonist. Keith says that his style evolved without ever having heard of the great Kurtzman, and that it was only after his work started getting published that cartoon fans pointed out to him the resemblance. I was also fascinated to learn that Keith, a young whippersnapper by any measure, is a fan of pioneering great Clare Briggs. A further delightful bit of news from Keith (and I hope I'm not telling tales out of school) is that we will likely be seeing much more of his work very soon -- I'll not let the cat out of the bag any farther than that. The one disappointment to me on this evening was that I missed meeting Ann Telnaes, who only attended this one event. Jim and I both agree that Telnaes is without peer in editorial cartooning (or for that matter, cartooning in general). Her one-two punch of hard-hitting ideas and powerful drawings sets her squarely at the very pinnacle of her profession. Jim was lucky enough to find her in the crowd and he reports that he fawned on her like a fanboy. Ann, if you happen to read this, everything Jim said goes double for me. After the reception Jim and I went to dinner with R.C. Harvey. It turned into a bizarre affair when the eatery we picked had their fire alarm going off all through our dinner. The entire restaurant was bathed in the staccato drumbeat of strobe lights, and occasionally a siren was added to the mix. The siren was a fine counterpoint to the screaming babies at the next table. With all three of our group in the hard of hearing category we spent our time unsuccessfully trying to read lips. Enough for today ... I'll continue my report tomorrow. Don't miss the exciting tale of Holtz taking a snooze on the street in Washington DC! The whole deal is so cool! I'm really happy that you were able to attend gratis because I know that it made Jim's trip all the more enjoyable. I totally agree with Jim [and you] in regard to Ann Telnaes. Do you know of any print sources that list editorial cartoonist Hy Rosen as the same cartoonist who did a variety of comic books in the 1940s and 50s, most specifically I Love Lucy? Sorry Susan, I'm not up on comic book stuff. Hi all, I'm back from DC but have a week's worth of work to catch up on in one day, so I'll do a post about the AAEC convention tomorrow. Until then please enjoy a belated Sunday Comics episode.